It will present a new work by Vancouver Fashion Week (28/9/2015-04/10/2015) .A work on the theme of ” waterfront ” from MATES series so please stay tuned. 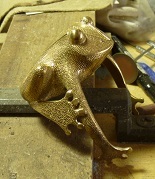 This gold color frog is gonna be painted like a chameleon bangle. This time it will make the exhibition in the venue specially. you can see the new work closely. Models wearing will be only at the opening gala. please come to see us!